Anuj Sharma, standing, meets with transportation researchers in the REACTOR lab, the Real-time Analytics of Transportation data lab. The lab tracks camera and sensor data from the Iowa Department of Transportation. The lab is part of the Center for Transportation Research and Education within Iowa State’s Institute for Transportation. Larger photo. Photo by Christopher Gannon. AMES, Iowa – Try this little experiment at home: Take a deck of cards, flip through a corner as fast as you can, watch the blur of numbers and symbols, then write down from memory, in order, each and every one. But a camera and computer get it right every time, said Neal Hawkins, the associate director of Iowa State University’s Institute for Transportation (InTrans). That kind of technology isn’t just for games, it can be a game-changer in all kinds of applications – including safely transporting people and goods around the state and all over the country, Hawkins said. Whether it’s artificial-intelligence, machine-learning or camera-as-a-sensor technology, Hawkins said combining computing power and data sets can make a real difference on busy roads. Iowa’s corn and soybean yields are up more than 40 percent since 1987, and some 80 percent of that harvest ends up on trucks. Truck volume on U.S. highways is expected to grow by 3.4 percent annually through 2023. There are more and bigger storms impacting travel. Crashes on U.S. roads kill, on average, 103 people every single day. 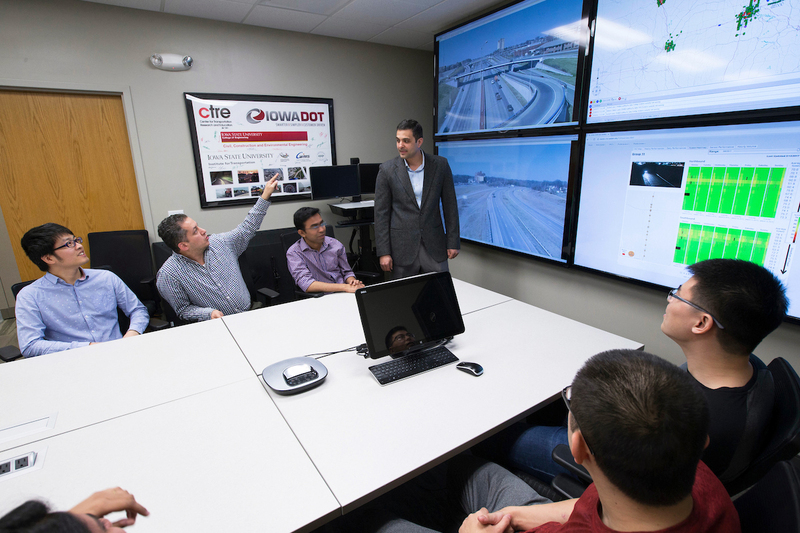 Those and other challenges have Iowa State engineers turning to new tools and technologies for better ways to manage traffic. Hawkins, recently presenting at a Google event that explored how researchers are using artificial-intelligence tools for social good, was asked to describe an “aha” moment in his work. Well, he said, it starts with the overwhelming amount of transportation data coming from cameras, sensors, probes and even smartphones. It was literally too much to process. Yet the people staffing the Iowa DOT’s traffic management center in Ankeny are expected to take in data from a 36-foot wall of monitors, make immediate judgments about safety conditions and call for help and post warnings. But, “aha,” maybe these powerful, new data-analysis tools from the tech industry could bridge the gap between viewing, measuring and storing all that traffic data and actually telling drivers in real time about problems up the road. The Iowa State researchers are using computers to scan camera feeds and sensor data to identify traffic problems and quickly alert DOT staffers. The project will take advantage of machine learning tools that will allow the system to learn from experience and find better ways to identify traffic problems – and maybe even predict them. Using data from cameras and even the GPS systems and accelerometers built into smartphones, the researchers will study how drivers respond to traffic signs, work zones and detours. They could even look at how older drivers respond to fatigue or drivers with diabetes respond when their blood sugar is low. One result could be “personalized transportation” with smart cars that could, for example, recommend leaving the road for a coffee break. Data tools can analyze forecast, radar and traffic data and predict the spread of winter storms and their effects on traffic, even to the point of directing plows to the areas that will be hardest hit. Artificial intelligence could even calculate the probability of crashes caused by rain, wind or snow storms and warn approaching drivers. Cameras-as-sensors mounted on vehicles can scan the ditches along roads and highways. Computer technology can analyze the footage to find and count the number of milkweed plants, the only host plant for monarch caterpillars. If counts are low, milkweed could be planted. And that could help establish an uninterrupted migratory corridor for the butterflies from Canada to Mexico. The bottom line of all those projects? There’s a big reason the Iowa DOT is working with Iowa State researchers to use computational tools to sort and analyze traffic data, said Scott Marler, the department’s director of operations. “We take it back to our mission – ‘Getting you there safely, efficiently, and conveniently,” he said. The department, for example, has “Highway Helper” trucks patrolling Des Moines, Council Bluffs and Cedar Rapids/Iowa City. Truck crews can help stranded drivers by offering a jump start, changing a tire or providing a few gallons of fuel. They also help with traffic control after a crash. A speedy response is vital. Marler said that for every minute a car is stalled or crashed in an interstate lane, the chance of another accident in the backed-up traffic goes up by 2.8 percent. So the department has asked Iowa State researchers to study traffic data in the Des Moines area and look for ways to improve response time. Are two trucks enough? Could they be staged in better places? Patrol different routes? Marler thinks there are answers to those questions and many others in all the data streaming into the department every minute of every day. Google takes a look at how the latest data tools can improve safety on Iowa's roads -- and could make bus trips safer for Iowa's students, even when the snow is flying. Researchers with Iowa State's Institute for Transportation (InTrans) are using artificial intelligence and machine learning tools to manage, sort and analyze the traffic data collected by the Iowa Department of Transportation. The idea is for researchers to use the latest computing tools to mine the huge data sets for useful information that could lead to safer roads.